The world is changing at an incredible pace and the opportunities for businesses to grow, differentiate, and compete have never been more dramatic than today. Grow fast or die. The world is changing at an incredible pace and the opportunities for businesses to grow, differentiate, and compete have never been more dramatic than today. The mandate is to grow fast or die. 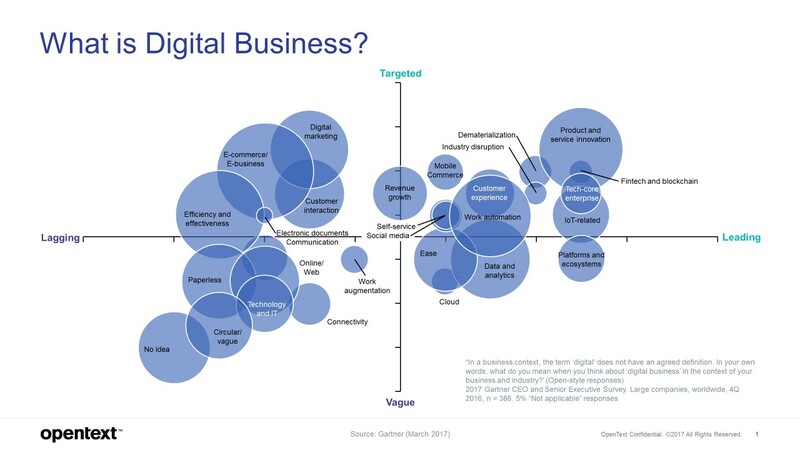 While businesses are adopting digital platforms to drive growth, the term "digital" still means many things to many people—as illustrated in the graph below. For some, it means going paperless with a digital mailroom. Others are focused on automating their processes for improved efficiency. For many, digital refers to e-commerce and online marketing initiatives. While these are all aspects of digital, they are not part of a comprehensive, transformational strategy. At OpenText, we are defining The Future of Digital. Our customers are re-platforming for digital. They are leveraging new information services, business networks, artificial intelligence, the Internet of Things, and low-code application tools. And these technologies must all be secure, run in the Cloud, and leverage mobile users. We call this The Future of Digital. Join us at Innovation Tour 2018. Discover how to transform your business by harnessing the power of information through extreme automation and insight. This is your chance to experience our digital vision, roadmap, and the portfolio of enhancements to our EIM platform. Innovation Tour 2018 is coming soon to a city near you. View the itinerary and register to attend. 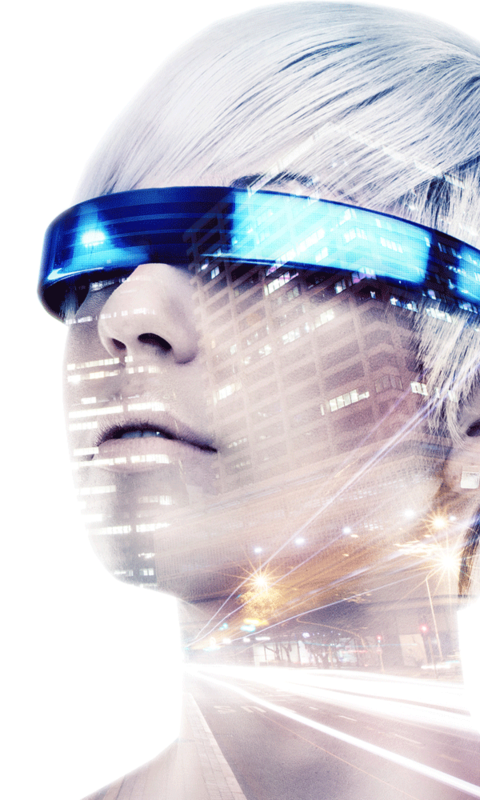 Be part of the conversation at this year's tour as we shape the Future of Digital together. Why spend the day with us? Innovation Tour 2018 is a 1-day conference packed with keynotes, customer case studies, demos, product roadmaps, informative technical sessions and partner exhibitors to help you in your digital transformation journey. We have something for everyone, whether you are a Line of Business (LOB) or Information Technology (IT) professional. Learn more about OpenText Magellan, a flexible, AI-powered Analytics platform that combines open source machine learning with advanced analytics, enterprise-grade BI, and capabilities to acquire, merge, manage and analyse Big Data and Big Content stored in your Enterprise Information Management (EIM) systems. Meet 3 new members of the OpenText Family. With these new additions, we continue to build a stronger and more comprehensive portfolio to help you drive innovation, move from engagement to insight, and fuel growth. Learn how OpenText solutions can help you digitise, automate, and optimise information flows — from Engagement to Insight. Chart your future with Enterprise Information Management (EIM) through roadmaps for all of our offerings and acquisitions. Discover the strategies, tactics, and tools you need to achieve transformational success in a digital world. What does the future of ECM look like? How can we make use of Automation, Analytics, and APIs? What are "Content Services?" How will these changes affect our existing infrastructure? What are the best approaches to succeeding in this new world? Get answers to all these questions and more. OpenText™ Solutions for SAP ® are specifically designed to extend the value of your SAP investment. Learn about the digital content platform OpenText offers to manage and deliver unstructured content to SAP's digital core, dynamically, in context and on any device. Marketing Leaders today need to deliver engaging digital experiences that not only delight their customers but help to drive brand loyalty and revenue, successfully scale and can connect multiple customer journeys anywhere, anytime and on every device. You will learn why the OpenText CEM software suite has the most comprehensive set of solutions to help you meet these needs. Spend the day with us at the Innovation Tour and learn more! NOTE: The venue is at walking distance from the Amsterdam Central railway station; we strongly advise for everyone to please use public transport to get to the venue. Please plan your trip via NS here. Or plan your complete itinerary via 9292 here. English option is available for both planner sites. Growing from a university start-up into a global team of 12,000 employees, OpenText is a worldwide leader in Enterprise Information Management with the most complete platform for digital transformation. We are proud to be Canada's largest software company. From coast to coast, and beyond, we help shape the future and put information to work.